Welcome to my Newbie Breakthru website! Any Aspiring Marketer Into A Business-Building Expert! What you are about to read is NOT a sales page so there is no need to scroll down and look for a price. There isn't one. Just the simple, honest truth about what it takes to have a successful online business. Let me show you how the Newbie Breakthru System can be YOUR turn-key solution to building a highly profitable online business! Please understand... I'm not trying to insult you. But if you want to quit struggling in your efforts to build an online business, then you need to hear the truth. You want to "make money online" rather than build an online business. You have spent more than you have earned in your efforts. You keep falling for "easy money" and "get-rich-quick" schemes. You suffer from information over-load. You still send all your traffic to a 3rd party affiliate page. You think a replicated affiliate page is YOUR website. You do not understand what you are promoting in your advertisements. You do not have a clear plan of action... aka "Business Plan." You do not use "funnels" for sales and marketing. 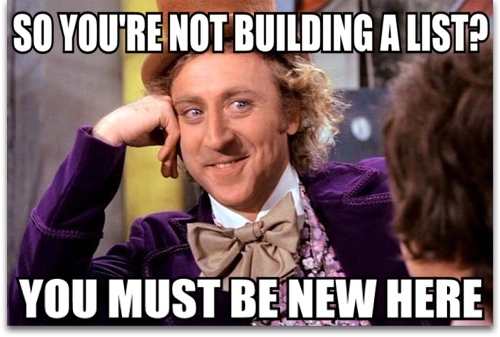 You are not building a list of leads for your own business! It's Time to Stop Thinking Like a Newbie! Many newbie-friendly systems are designed by very good sales people with one goal in mind. They target beginning marketers looking for a "Golden Ticket" that requires as little work as possible. These so-called "easy money systems" do not try to help you grow beyond being a newbie. They sell you what you WANT... rather than what you really NEED. Stop falling into that trap! To break free from the Newbie Trap you need to change your mindset. To put it simply, change the way you think. Frankly... stop thinking like a newbie. Quit thinking there is some easy secret to discover. There isn't one! If you want to be a successful marketer, start thinking like a successful marketer! They have a clear plan-of-action. They are not shoppers. They are not prospects... they are doing the prospecting (and selling). They establish themselves as experts that other people listen to before they promote any 3rd party affiliate products. They have ways to make sales and keep 100% of the profits instead of putting all of their business in someone else's hands. They realize no business ever grows itself and there's no free lunch. They invest wisely into the tools necessary for success in their marketing. Get ready to stop being the "hunted" and become the hunter! What you are about to see on the next page is the exact process that propelled my business forward and transformed me from prospect to successful marketer. CLICK HERE to reveal the Automated Sales process that set my business on complete autopilot. From list building and lead generation to getting referrals and sales... find out once-and-for-all how successful Internet Marketing is really done. Escape the newbie trap and start building your business like a pro!